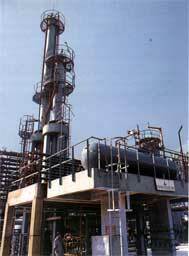 The construction work of first Lube Refinery was started in May 1964. The Refinery came into production in June 1966, with crude oil refining capacity of 539,700 tons per annum and production of 76,000 tons of various grades of Lube Base Oils and 100,000 tons of Asphalt per annum. This Refinery also supplemented fuel products requirement of the country particularly Kerosene and Diesel. On January 16, 1972, the Government of Pakistan took over the management of the Refinery under the Economic Reforms Order. The overall managerial directions were entrusted to the Ministry of Production. The growth in demand of fuel products in the subsequent years, after installation of first Lube Refinery, impelled the need for further increase in refining capacity. In the year 1974, National Refinery Limited signed an agreement with Industrial Export and Import of Romania to construct a Fuel Refinery having crude refining capacity of 1.5 million tons per year on turnkey basis. Since the Fuel Refinery was to be integrated with the first Lube Refinery, a site on the same premises was selected. NRL's Fuel Refinery was a fresh addition on the country's growing industrial landscape. The Fuel Refinery was commissioned in 1977 for producing LPG, Motor Gasoline, HOBC, Naphtha, Kerosene, Jet Fuels (JP-l), (JP-4), High Speed Diesel Oil (HSD), Furnace Oil. In order to meet country's demand of petrochemicals/solvents Benzene, Toluene and Xylene, particularly Toluene, to meet Defense requirements, installation of a BTX plant was seen feasible. Feedstock to BTX plant was also available from the Fuel Refinery. A Petrochemical BTX plant was therefore installed in 1979, which was capable of producing 25,000 Metric tons per Annum of Benzene, Toluene and Xylene. 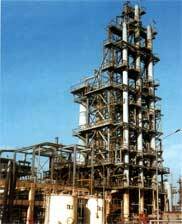 The country's first petrochemicals unit was integrated with the units of the Fuel Refinery. Currently it is out of operation. In order to meet high purity Propane requirement for extraction and refrigeration at various units of Lube Refinery, a Propane Recovery Unit was installed and commissioned in 1980. Detailed engineering and fabrication for the entire plant was done locally. The plant is designed to produce 1,200 tons per annum of high purity Propane, which meets the requirement of both Lube Refineries. In early 1980's the industrial growth in Pakistan changed the petroleum products supply demand scenario. Fuel business was saturating whereas there was a captive market of lube oils in the region. In view of this, NRL installed its second Lube Refinery, which was commissioned in 1985 for producing 100,000 tons of Lube Base Oils. The feedstock for this Lube Refinery was available as surplus Furnace Oil from Fuel Refinery, which was upgraded to Lubes. Basic engineering and design work for this project was carried out by CE Lummus of U.K under consultation with Taxaco Development Corporation of USA As a result of concerted efforts, a refinery representing the latest technology appeared in the highly impressive NRL Complex. The completion of second Lube Refinery created the largest and the most comprehensive crude oil refining complex in the country. Demand of fuel products in the country had positive growth rates in the late eighties. However, the cost effectiveness of the projects gained prior importance. 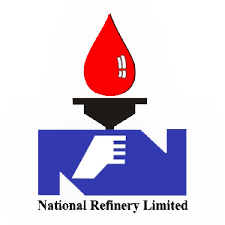 Thus, in order to keep-up the pace with modern refineries and to reduce the processing cost per barrel of crude, NRL implemented its Fuel Refinery Revamp Project in 1990. The revamp project was based on Energy Conservation, enabling the capacity increase by 15,000 BPSD without increasing energy consumption. After the revamp, the total crude processing capacity of NRL was enhanced to about 2.71 million tons per year. The balancing and modernization of platforming unit was undertaken in 1995 and installation of larger sized reactors in 1997. Increased production of High Octane reformat by 70%, gave potential for production of high quality, unleaded motor gasoline. The corporate control of National Refinery was transferred to the Ministry of Petroleum & Natural Resources. Based on the principle of cogeneration from high-pressure steam boiler, a 7.5 MW power generation unit has been installed to decrease dependence on purchased power supply. With the commissioning in year 2000, beside energy conservation and supplying low cost electricity, the Self Power Generation is helping in reducing production losses due to interruption in power supply. In order to meet the growing demand of LBO, a Lube Revamp Project was undertaken with the Technical Assistance of Exxon Mobil in year 2005. On completion of the Project, the production capacity of the second Lube Refinery was enhanced by 14,800 TPA. Dilchill Crystallization Process Technology was utilized for production of High Viscosity Bright Stock (BS HVI) grade of Lube Oil. Company has implemented Product Metering System at refinery and Keamari Terminal for custody transfer of product to Oil Marketing Companies (OMCs). Initially project is handling HSD pumping to OMCs. Radar Gauging System for accurate measurement of tanks for custody transfer has been installed on 105 tanks. The company has a strong information technology capability. Computerized instrumentation and auto-tank gauging are being applied. The technical staff uses a variety of computer software for process design, performance monitoring, simulation and engineering design. The Company has successfully completed the revamp of crude distillation column in April 2017. As a result, the crude oil processing capacity has been enhanced by 3000 barrels per day increasing the overall designed capacity from 62,000 barrels per day to 65,000 barrels per day. In line with the direction of Ministry of Petroleum and Natural Resources to achieve Euro-II standard HSD (less than 500 ppm) NRL successfully implemented the project of Diesel desulphurization (DHDS). The plant has a capacity to reduce sulphur to as low as 10 ppm which may help NRL to meet future requirements. The project was successfully commissioned in June 2017. The project cost of DHDS incurred by the company is Rs.26 billion, without any major increase in revenues as the incentive initially announced by the Government for increasing the deemed duty from 7.5% to 9% has been delayed. The company is in discussion with GoP to allow refineries increase in deemed duty so that the huge investment cost and processing cost could be recovered. Isomerization project started two years ago has been successfully commissioned in October’ 2017. Through Isomerization company would succeed in converting majority of its Naphtha, which has no local market, to Motor Gasoline which would meet the Country’s requirements as well as result in fetching higher price. Total isomerate production capacity of NRL is 6,793 BPSD.